Mention balance and you may instantly form a mental picture of a tightrope walker, a gymnast on a balance beam, or a dancer on tiptoe. Every day, you walk a metaphorical balance beam – teetering between family life and work commitments, praying you won’t fall. A scoop of ice cream and a cup of broccoli tug on you from opposite sides of the beam. Even your checkbook begs to be balanced! While we’re not talking about physical balance, exactly, the mental image can be healthy when considering what balance means in your life. Consider the trail runner, the ballerina, or the gymnast – athletes who make their motion seem so effortless. When your life is in balance, it too becomes effortless. Not easy – after all, the runner, the ballerina, and the gymnast all train hard, pushing mind and body to a level most of us can’t even comprehend! 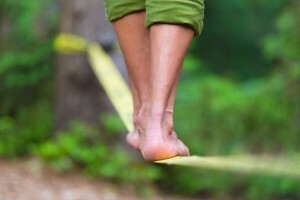 But achieving balance gives you the grounding and agility to float through life, avoid tripping over obstacles, and bounce back without injury when things go wrong. The elite athlete knows that kind of balance comes from consistent practice, constant reevaluation, and grounding in physical strength. And the same is true for the rest of us. Practice creating balance in your life; constantly reevaluate your progress; and cultivate the inner strength that will keep you grounded and allow you to tackle life with grace and ease. This entry was posted in Balance, Mindfulness, Prescription for Health, Thrive, Zen Habits. Bookmark the permalink.